You may have read in different farming publications about the presence of bean platasipid (Megacopta cribraria), or more commonly the kudzu bug, in the southeastern US. It is referred to as the kudzu bug because it has a tendency to feed on kudzu. This is not necessarily a bad thing in the south where kudzu is an exotic invasive species. In the southeastern US kudzu bug has become a concern because it is also a pest of soybeans. This stink bug species is smaller than brown marmorated stink bug and has a different shape. Like brown marmorated stink bug it also can overwinter in homes. This stink bug species was discovered in Georgia in 2009 and has since spread through out the southeast and is heading north. The kudzu bug has most recently been found in Sussex County Delaware. It has also been found in Maryland in Prince George, Charles, Calvert, and Anne Arundel counties. 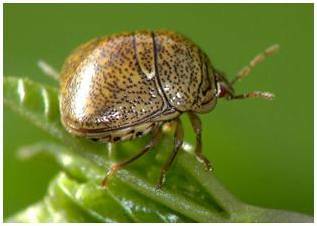 As kudzu bug is a soybean pest we need to keep a watchful eye for it here in New Jersey.